BNSF and CP Train Action in the Bakken Oil Field! Great BNSF and CP train action across the Bakken Oil Fields in scenic Northwestern North Dakota. See long crude oil unit trains as they travel across the beautiful North Dakota prairies and come rolling through several small towns and cities. Plus other exciting train action including unit trains of frac sand, grain and intermodal along with road freights and locals. The BNSF Railway dominates the train action on Volume One along with a good amount of Canadian Pacific trains and a few of Amtrak's passenger trains. This program also features the spectacular Gassman Coulee Trestle, a few historic depots and the train action hot spot of Minot which includes Soo Tower where the main lines of the BNSF and CP cross at grade. Also see some oil wells and drilling rigs in the Bakken Formation where the oil cans are filled and sent out by rail to the refineries across the U.S. Rail footage era September, 2014. Great Canadian Pacific, BNSF, NPR, DMV&W Train Action! Great Canadian Pacific and BNSF train action across the Bakken Oil Field in scenic Northwestern North Dakota. See long crude oil unit trains as they travel across the picturesque North Dakota prairie and come rolling through several small towns and cities. Plus other exciting train action includes road freights, intermodals and locals. The Canadian Pacific dominates the train action on Volume Two along with a good amount of BNSF action. Plus segments on two North Dakota Regional Railroads including the Northern Plains Railroad and the Dakota Missouri Valley & Western Railroad. This program also features the train action hot spot of Minot including Soo Tower, the scenic Des Lacs River Valley and the spectacular Valley City Trestle. Also see some oil wells and drilling rigs in the Bakken Range where the oil cans are filled and then sent out by rail to the refineries across the country. Rail footage era September, 2014. Award Value: 249 Points Earn points for free DVDs. Signup free. mySP7377 (San Diego CA US) on 2016-10-28 23:34:49. Plets Express has always made a great DVD going back to the 90's when I was buying them on cassette there were always full of information, and excellent photography. 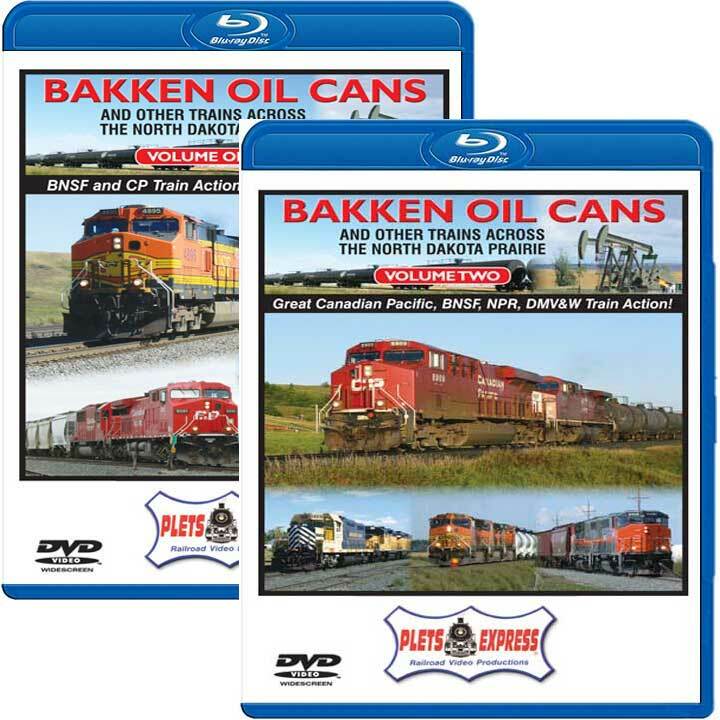 These two volumes on the Bakken Oil Cans is no exception, the photography is excellent...if you can play Blue Ray get the set that way the image quality is fantastic, narration is informative, one of things I like about his narration he puts a lot of research into the subject, you get a lot more info than just a quick mention about the train that's going by. Vol 1 & 2 covers all the action on these unit crude oil train's. A wide variety of power is seen, run troughs from every class one road out there, NS Heritage units show up to top it off "Must Have It "
Train Buff (Southern California) on 2016-04-26 17:03:02. One thing I particularly like about this producer is that he includes a map of the area, printed on paper, inside the BDV/Blue Ray case. The narrator then tells you just where the films are being taken. Makes it easy to follow just where the trains are geographically. Increases the enjoyment of the video. run8anderson (Basking Ridge nj) on 2015-07-22 15:07:17. Folks.....you've all heard about the Bakken oil fields. Well.....this is the premier look into the rr activities of that region. This is a 5 star production. Videography, editing, image quality and history. You WON'T be disappointed. I wasn't. Hope you have a BluRay, because that is superb.